These pages tell the short, but dramatic, story of offshore 'pirate' radio from 1958 to 1970 and contain the most accurate information I can find, derived from a large variety of sources. Not unsurprisingly, many accounts are contradictory and, where I have found this to be the case I have taken the point of greatest consensus. For this reason I can't take any responsibility for the (hopefully few) inaccuracies but I would, of course, be absolutely delighted to change any incorrect statements if you would take the trouble to email me and substantiate it with some documented or verifiable evidence. You will be able to find other sites with more detail on individual stations but I have tried to give the complete story in the order that it all happened, including some of the more interesting details and stories. There are a large number of facts and dates involved and to keep the work reasonably short they are presented in a kind of diary format. Many of the images, when clicked on, provide a larger or alternative image for you to see. The history does tend to jump forward and back in time just a little bit in places, but only in an attempt to make the thing more readable and to give a better understanding of what was going on. In researching it, I certainly got quite confused a number of times about particular chains of events and have tried to resolve that problem for you. Even so, it is still occasionally updated.There were, of course, 'pirate' or 'free' radio stations in operation as early as the 1930s, neither did it end in 1969 - 'Pirate Radio' lives on! 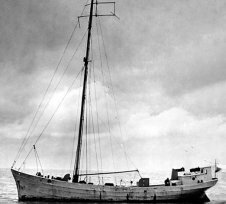 It was sometime around July 11th in the summer of 1958 when a small ex-fishing boat called 'Cheeta', owned by lb Fogh and Pete Jansen, was moved to a location south of the island of Ven off the coast of Denmark to begin test radio transmissions in Danish on 93.12MHz under the name of 'Radio Mercur'. The programmes had been pre-recorded at their own studios in Copenhagen and were broadcast between 6am and midnight. Radio Mercur had been on air for less than a week on July 17th when transmissions were interrupted by 'Cheeta' losing her anchor and ending up aground outside Malmo, Sweden, holing herself below the waterline. After necessary repairs she returned to international waters between Copenhagen and Malmö where she recommenced broadcasting on August 2nd. To prevent interference with a Swedish land-based radio station the frequency was changed to 89.55MHz on August 29th, with increased power. 'Cheeta' also made broadcasts in Swedish under the name of 'Skånes Radio Mercur'. This particular station was started by a Swede, Nils-Eric Svensson, who leased air time from the Danish station. In 1958 recorded music was limited to 60 minutes per day by Sveriges Radio, so very little actual 'pop' music was played. The 'Skånes' station played only music, particularly pop, and was an instant success, attracting up to 80% of the listeners during its limited broadcasting hours. The broadcasts were on FM and covered only the more densely-populated south-west part of Sweden, Skåne, including the cities Malmö, Landskrona and Helsingborg. 'Cheeta' was previously registered in Panama but, following pressure from the Danish government, Panama withdrew the registration on 29th August 1958. The vessel was then claimed to be registered in Honduras but was later discovered to be stateless. It had been realised, by then, that this small boat was completely unsuitable and the owners started to look for a second, larger vessel. During November 1959 a group of people including Gordon McLendon, Bob Thompson and Jack Kotschack acquired the ex-cargo boat 'Olga'. This was probably one of the most re-named and modified boats of all time. She was originally built in 1921 as a 96ft, 3-masted schooner called 'Margarethe'. She was sold to Heinrich Koppelmann in 1927 who renamed her 'Olga', after his wife. An engine was installed in 1928 and, in 1936, her length was increased to 111ft. After seeing service with the Kriegsmarine during the war she was decommissioned in 1943. In 1951 she was again lengthened and sold in 1959 to the McLendon group who planned to use her to operate a Swedish commercial radio station to be called 'Radio Nord'. She was taken to the Norder Werft shipyard in Hamburg, arriving on 31st May 1960 where she was re-named 'Bon Jour' and her hold was converted for use as radio studios. In August they were advised that, under German law, it was illegal to install radio equipment so she was then sailed to Langelinie, Denmark to have her transmitters and aerial fitted. It was originally planned for her to have two aerials, but only one was eventually fitted. She left Denmark on 20th December 1960 bound for Stockholm, Sweden. She ran into weather trouble during the voyage, requiring considerable repairs to her mast. These were carried out off the coast of Finland as the Finnish government would not allow the work to be carried out in harbour. Repairs were completed on 4th February 1961 and the ship headed for Ornö, Sweden, arriving on 6th February. From late November 1959 a company called 'Anstalt Veronica' (the name was derived from the original project title VRON which stood for 'Vrije Radio Omroep Nederland') had also been converting a vessel, the ex-German lightship 'Borkum Riff', for radio broadcasting. On April 21st 1960 Radio Veronica began test transmissions on 185 metres from a position 3.5 miles off the Dutch coast at Katwijk-aan-Zee. Regular broadcasts began on 6th May 1960 but the Dutch PPT at Nordeich were soon trying to jam their signals so the wavelength was changed, first to 182 metres and shortly after, on May 15th, to 192 metres which it continued to use throughout the Sixties. A survey in November 1960 estimated its audience to be in the region of 5 million listeners. The station was originally owned by two Amsterdam radio dealers whose transmitter was of such comparatively low power that they were unable to sustain the station commercially. It was taken over by the Verwey brothers, from Hilversum, who installed a 10kW transmitter that enabled the station to be heard throughout the Netherlands, a large part of Belgium and, of course, the east coast of England. Programmes were pre-recorded in studios at Hilversum and transmitted from on board the ship, consisting mainly of pop music with occasional specialist programmes for oldies, jazz and country & western. Only the hourly news, weather bulletins and time signals were broadcast live. During the spring of 1961 the company bought and maintained its own twice-weekly supply tender ('Veronica' crews changed weekly) which was a converted fishing boat called 'Ger Anna'. By the end of January 1961 Radio Mercur had acquired, on a hire basis, the larger radio ship they were seeking and christened it 'Cheeta II'. 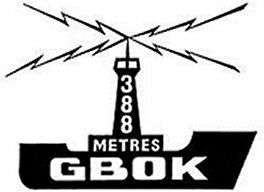 It boasted two transmitters after radio equipment had been transferred from the smaller vessel and, on January 31st, it began broadcasting programmes in both Danish on 88MHz and Swedish on 89.55MHz. They even tried an experiment in stereo broadcasting, using both transmitters simultaneously, which took place on February 7th. It had been thought that the smaller vessel, now known as 'Cheeta I', might be used as a tender but this proved to be uneconomical so, in July of that year, it was sent to Norway for repairs, checks and a refit as a radio ship again. On 6th February, the same day as her arrival, more damage was done to the mast of 'Bon Jour' during another storm. Despite this, after several months of technical problems, Radio Nord finally began making test transmissions on 495 metres on February 7th. At the time the vessel was still smack in the middle of Stockholm harbour, which didn't go down too well with the Swedish authorities! A lot of interference was experienced from land-based Radio Lyon transmitting on 498 metres, so the frequency was quickly changed to 602kHz which confused a lot of their listeners. She eventually sailed to her anchorage to begin broadcasting on 21st February, but had to return for further repair work within a few days, returning on March 1st. The following day the Swedish Government passed a law enabling confiscation of broadcasting equipment from any ship operating in Swedish waters and applied pressure on the Nicaraguan Government to withdraw the ship's registration. The ship was re-registered in Panama and re-named 'Magda Maria'. 'Magda Maria' started 'official' broadcasting as 'Radio Nord' from international waters off Stockholm on March 8th. 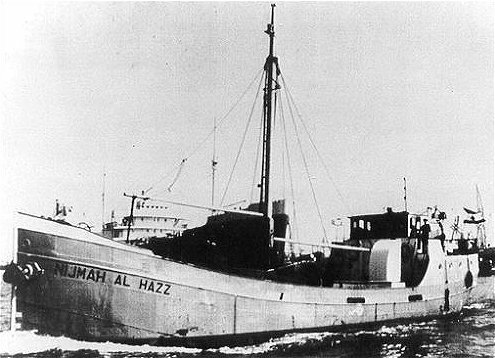 Their programmes were generally pre-recorded, being delivered to the ship either by tender from Nynäshamn or being dropped near the ship in a waterproof container from a light aircraft, an operation that was surprisingly successful as only one container is believed to have been lost using this method. 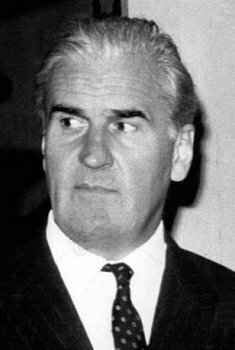 A broadcaster called 'The Voice of Nuclear Disarmament' began a brief offshore radio operation on February 10th 1961, run by John Hasted, an activist in the Committee for Nuclear Disarmament. The announcer was Lynn Wynn Harris, wife of Hasted, who made several propaganda broadcasts, heard in London, urging people to attend non-violent protest rallies. 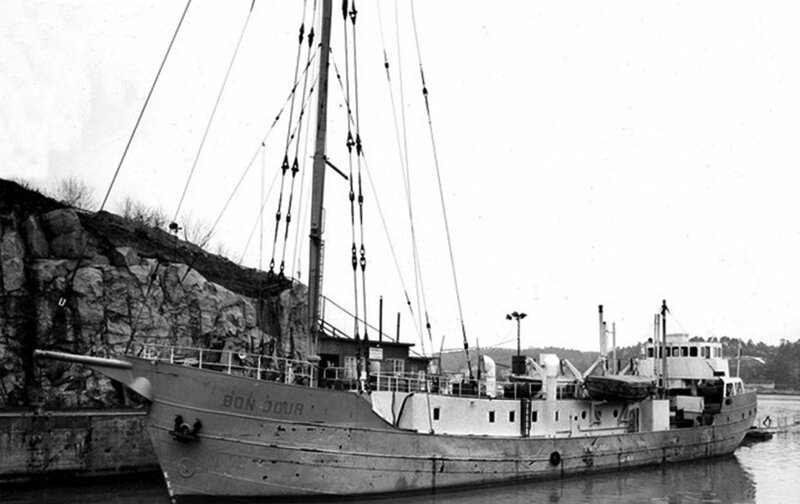 On February 16th the first broadcast intended for British audiences could be heard from Hull to Margate, transmitted on 192 metres between 5am and 7pm, from CNBC (Commercial Neutral Broadcasting Co.) based aboard the vessel 'Borkum Riff'. The disc jockeys involved were Bob Fletcher, Paul Hollingdale and Doug Stanley but despite their efforts the project was fairly short-lived, being discontinued round about the end of the year in favour of Dutch programmes. Although the Dutch government tried increasingly hard to put them off the air, Radio Veronica was to continue broadcasting offshore throughout the Sixties and well into the next decade. In 1961 a little-known project was mooted by Canadian businessman John Thompson, to be named either 'GBLN' (GB for Great Britain and LN after his wife Ellen), 'Radio Ellen', 'Radio Elb' or 'The Voice of Slough' - take your pick! 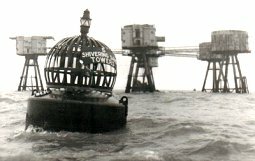 The station was going to transmit pre-recorded programmes, 24 hours a day from a 70-ton vessel, on 306 metres, from an anchorage near the Nore lightship, about three miles off the coast of Southend. 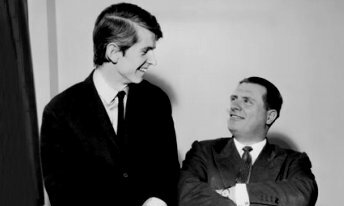 Disc jockeys Keith Martin (later of Atlanta and Caroline South) and Roger Gomez (later of King Radio and Radio 270) were employed to make the initial planned programme recordings. When the acquisition of the original vessel fell through a 65ft fishing boat was purchased in Leith and sailed down to Dunbar but, having inadequate engines for seaworthiness and no communications equipment, was eventually abandoned in the harbour. 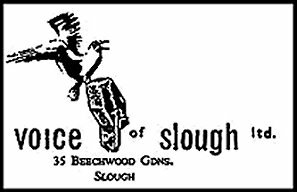 One test transmission was made by 'The Voice of Slough' using a 1kW RCA transmitter but that was all that was ever heard. John Thompson was, eventually, to become one of the people behind Radio Invicta, which also used the 306 metre wavelength. The music trade papers at the turn of the year carried articles about another proposed station, to be called 'Radio GBLN' or 'Radio GBOK', which would tape programmes in Dublin and transmit them from an 84 year-old lightship called 'Lady Dixon' in the Thames Estuary utilising a 5kW transmitter with a range of about 100 miles, on 388 metres. Both of these projects were also initiated by John Thompson, the latter one with his countryman, millionaire Arnold Swanson. A studio was constructed at Swanson's home in Buckinghamshire, a London office set up and programmes recorded by Ed Moreno (later of Caroline and Invicta). Although many staff members were lined up and a 5kW transmitter purchased, frequent problems were encountered, including financial issues, mainly due to drawn-out but inconclusive negotiations with the British Phonographic Industry regarding taping of the music content and the project was eventually abandoned without making any actual transmissions. This was a mistake that the later pirates certainly did not repeat - they didn't bother with any sort of legal negotiations regarding 'content' until they were already happily broadcasting the sounds from the safety of international waters. 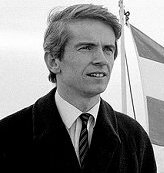 In August 1961 Nils-Eric Svensson, realising that laws being introduced by the Swedish Riksdag would be very likely to close down the offshore broadcasters, sold his interest in Skanes Radio Mercur to the station's Sales Manager, Mrs. Britt Wadner, who was formerly a Swedish beauty queen. September 15th 1961 saw DCR (Danmarks Commercielle Radio) start transmitting programmes, on 93.97MHz FM, which had been pre-recorded in Copenhagen. 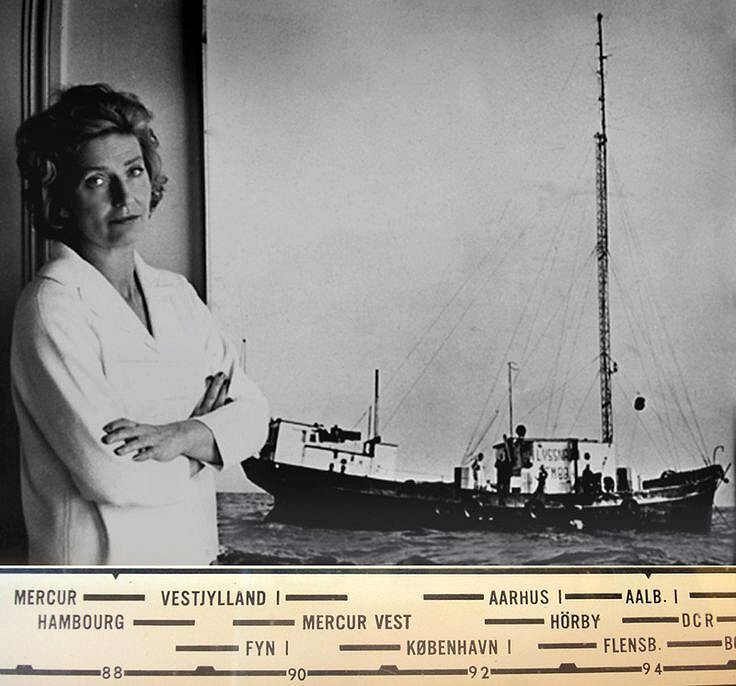 The station was based on the radio ship 'Lucky Star' (originally called 'Nijmah Al Hazz') anchored off the coast of Copenhagen in the Øresund, close to the ship of Radio Mercur, and run by ex-staff of Mercur who had left after a disagreement regarding profit over programme quality. DCR were one of the first pirate stations to transmit a 5-minute news bulletin, at 7am and 7pm, beginning in January 1962 but, despite their ideals, their own content (a mixture of light and more serious music and plays), DCR proved to be unpopular with their target audience. The Radio Mercur ship 'Cheeta I' completed her refit and moved to a position off Zeeland on November 25th 1961 where she recommenced broadcasting on 89.58MHz. DCR merged with the rival Radio Mercur on January 29th 1962 and the ex-DCR ship 'Lucky Star' took over the broadcasts for Radio Mercur on 88MHz. 'Cheeta I' stopped broadcasting again on 12th February 1962 when it experienced trouble during a gale. After putting out a distress call, the vessel was towed by tug to Copenhagen where it was boarded by police and impounded for lack of registration. In March 1962 Britt Wadner bought 'Cheeta I' as a going concern, to get away from having to hire limited air time from Mercur. 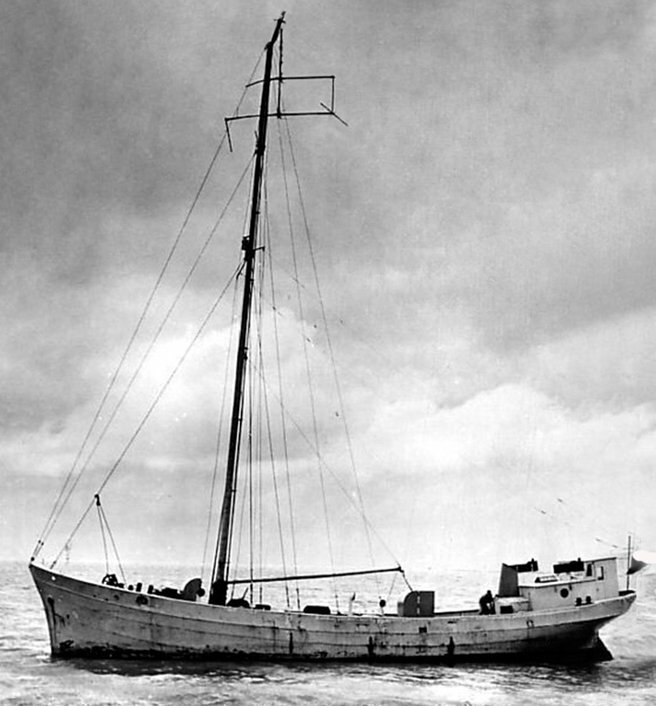 Shortly afterwards, the repaired 'Cheeta I' was taken to an anchorage off Malmo, Sweden, and began broadcasting on 89.62MHz FM as the newly-named 'Radio Syd'. The station changed its frequency to 88.3MHz FM only hours before the Swedish government planned to start jamming their signal via their radio installation at Halsingborg as, on March 29th 1962, the governments of Norway, Denmark, Sweden and Finland all agreed to introduce measures against offshore broadcasters. This would make it illegal to supply, broadcast from, advertise on or provide any assistance to offshore stations, except where rescue was involved, and were due to come into effect at midnight on July 31st of that year. Interestingly, Norway and Finland did not, at that time, actually have any pirate stations! Radio Syd continued to broadcast after the Riksdag passed the Swedish Pirate Radio Act, 'Lex Radio Nord', which forbade Swedes owning radio transmitters and also banned broadcasts from international waters if they interfered with Swedish Radio. However, this law proved to be the end for Radio Nord, which closed down on June 30th, the first offshore 'pirate' station to be closed as a result of government legislation. Their radio ship sailed for Galveston, Texas, where she remained for a year until 1963, but the 'Magda Maria' was a long way from being finished with the pop pirates. DCR put up a bit more of a fight and the 'Lucky Star' continued broadcasting until the end, finally shutting down at five minutes to midnight on July 31st. 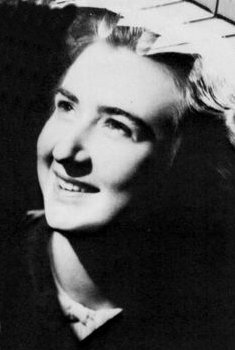 Radio Mercur had already shut down the 'Cheeta II' operation on July 10th 1962, after a similar law was passed by the Danish Folketing, and she was taken to Elensburge in Germany. The new law should have been the end for Radio Mercur but the 'Lucky Star' recommenced transmissions a couple of weeks later when some ex-staff made some broadcasts using old Radio Mercur programme recordings. The ex-manager of the defunct station denied any knowledge of the broadcasts, claiming he had only used the ship on a hire basis and that it had, by then, been repossessed by its owners. 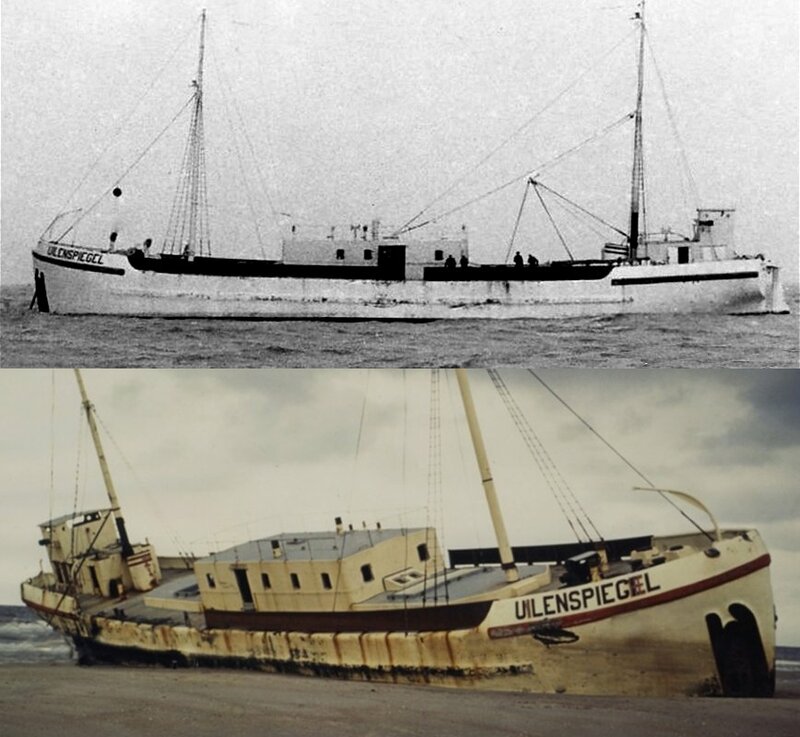 The station finally went off the air on 16th August 1962 when armed units of Danish police boarded 'Lucky Star' and impounded the ship until ownership and registration could be established. The ship was flying the Lebanese flag at the time but no registration form could be presented to support this, or the ship's captain's claims that it was actually registered in Guatemala. The ship was impounded and all the equipment removed. It is unknown whether ownership or registration of the vessel was ever established. During late 1962 a pirate station called 'Radio Antwerpen' had been broadcasting Flemish programmes from the ship 'Uilenspiegel' off the coast of Belgium. On December 16th she went aground at Cadzand, on the Dutch coast, after breaking her anchor chain only a matter of days after Belgian anti-pirate legislation was introduced banning offshore stations. The remains of the gradually-sinking ship were eventually blown up in 1971 as they were considered to be a shipping hazard. Also in 1962 a consortium called 'Project Atlanta Ltd.' (named after Atlanta, Texas) contracted to acquire the ex-Radio Nord ship 'Magda Maria' and she was moved to El Ferrol on the north-west tip of Spain for refitting. The vessel was owned, at that time, by Gordon McLendon, the Texan broadcasting pioneer who created Radio Nord, and Clint Murchison, an entrepreneur from Dallas who promoted U.S. political interests. The 'Magda Maria', now renamed 'Mi Amigo', left Spain on September 14th 1962 giving her destination as Dover, but somehow ending up in the Thames Estuary. It is possible that some early tests were made from the 'Mi Amigo' as a mystery station identifying itself as 'Radio LN' was heard around this time, on 306 metres, with no other known source. During 1961 and 1962 there was even a 'pirate station' invading television broadcasting. 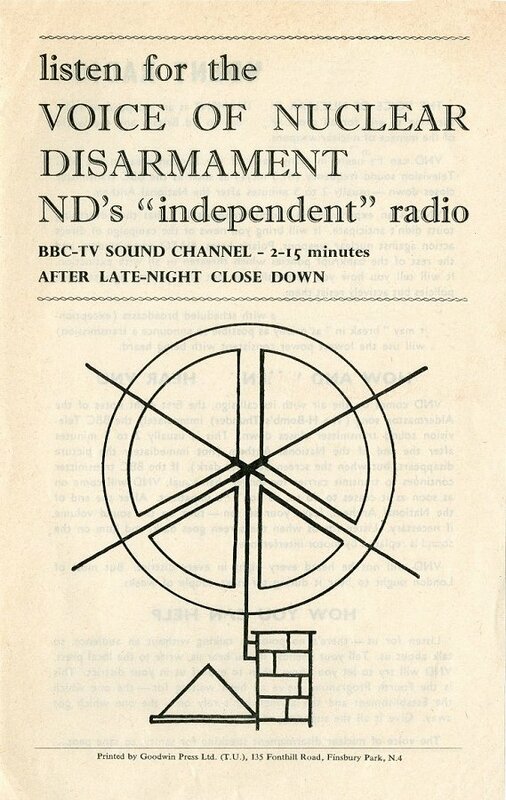 The Voice of Nuclear Disarmament made a number of broadcasts on the audio channel of BBC Television after they closed down at 11 p.m. and was heard in parts of London. It is alleged to have had the backing of the Committee of 100, urging people to attend their rallies. The Atlanta project was stalled, however, due to the events surrounding the closure of Radio Mercur, which scared off the financial backers, and the ship was forced to sail to Ostende. She was reported as being at Flushing between January 11th and 15th before setting sail again, then had to stop at Brest for repairs to damaged steering gear on the 19th, which took a week. 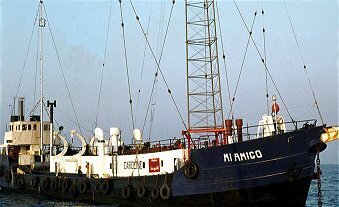 On January 26th 1963 the 'Mi Amigo' left Brest heading for the southern coast of the United States where her American owners stripped out the broadcasting equipment and planned to turn her into a luxury yacht at Galveston, Texas. Project Atlanta finally managed to secure sufficient finances to purchase her on December 18th and, in early January 1964, she once again crossed the Atlantic, arriving in Las Palmas on January 30th, having nearly sunk during the voyage. On February 5th 'Mi Amigo' docked at El Ferrol for repairs and stability modifications to be carried out, as well as a complete refit for the stripped broadcasting equipment. Project Atlanta was a British consortium that had been formed by political, banking, theatrical and music publishing interests and was headed by Australian businessman Allan Crawford who had previously been associated with Southern Music in Sydney and London between 1955 and 1959. He was the owner of Merit Music, various music publishing companies and several record labels which mostly produced cover versions of successful chart records. Due to the difficulties encountered with getting air time for his records in the U.K., due to the government monopoly on broadcasting, he saw pirate radio as an ideal solution. He was not personally intent on breaking the monopoly, just on getting his music on the air to enlarge his musical business. The same could not really be said for fellow board member Major William 'Oliver' Smedley, who had been a political campaigner for 'free information' and was opposed to governmental control of the airwaves. He had earlier been involved with Sir Antony Fisher, who invented the first modern think tank 'The Institute for Economic Affairs' in the 1950s (in 1965 the IEA was to publish a booklet to 'lay out the philosophical and political theory behind pirate radio' with a section called 'Piracy as a Business Force'). Another founder board member was theatre figure Dorothy 'Kitty' Black whose industry prestige, contacts and financial support were important to the project. She had seen the Danish 'pirate' station operations and suggested the idea of a British-based station to Crawford. Together they presented the idea to Smedley, who was thought to embrace the concept of using 'pirate radio' as a weapon to promote Friedrich Hayek's theories about the freedom of information, although the chance to make some money probably did not go unnoticed by him either. Property developer Max Rayne was another board member. Not a particularly lucky ship, 'Cheeta I' was in trouble again on 9th January 1963 and, after drifting in pack ice to the north east of Saltholm island, she was towed by tug to the Malmö Yacht Club harbour at Limhamn. In 1964 Britt Wadner bought the larger vessel, 'Cheeta II', from the defunct Radio Mercur to continue broadcasting as Radio Syd and, in August, after repeatedly being summonsed and fined for offences against offshore broadcasting laws, she was finally sentenced to prison for one month. Amazingly, due to curiosities in Swedish law, she was allowed to continue recording broadcasts for the station from her cell in Anstalten Hinseberg, Örebro, during her incarceration. While all this was going on, Ronan O'Rahilly had also quietly been putting his own plans into action. Although generally credited as the 'founder' of British pirate radio, he had acquired the Atlanta business plan from Allan Crawford and shared it with associates, using it to formulate a plan for their own station. He had met Allan Crawford in his office in 1962 to discuss the Atlanta project and persuaded him that his father's port in Greenore, Ireland, would be ideal for adapting his radio ship in secret. In return for the offer, Crawford discussed all his plan details, covering registration flags, costs, financing etc. Ronan had been involved in several enterprises, including running an acting school in Knightsbridge in the late Fifties called 'Studio 57', one of his students there being a certain young man called Simon Dee (Dee was later to leave his £45 per week job with an estate agent to join Caroline as a DJ at £15 a week). By the early Sixties, now as a Soho night-club owner ('The Scene' in Great Windmill Street) and a music industry entrepreneur who had been finding it nearly impossible to get airtime for his artists (particularly Georgie Fame) on U.K. mainland stations and Luxembourg, he badly needed a way to break the monopoly enjoyed by the 'big four' recording companies Decca, Philips, EMI and PYE. Inspired by Radio Veronica, he had seen the answer to his problems in the creation of his own radio station. When a series of delays occurred due to the withdrawal of various financial backers, he eventually acquired sufficient funds and his business partner, Chris Moore, was despatched to Rotterdam, Holland, where the ex-Danish passenger ferry m.v. 'Fredericia' was purchased from the Swiss firm Alranne, with O'Rahilly renaming it 'Caroline' in honour of John F. Kennedy's daughter. On February 13th 1964 it left Rotterdam heading for Greenore in Eire, a port which was owned by his father, to be refitted for broadcasting. The original board of directors for 'Caroline' included John Sheffield (chairman of Norcros) and C. E. Ross (owner of the Ross company group) who held 88% of the Caroline company's shares between them. Another member of the group of financial backers was Jocelyn Stevens, Sheffield's son-in-law, who was chief editor of 'Queen' magazine and whose Fetter Lane offices the company was to share during the station's launch period. Two days later, on February 15th, Atlanta's 'Mi Amigo' sailed for Corunna, leaving there on 3rd March, also heading for Greenore, to have a new aerial mast fitted. This came about as the result of an agreement with Allan Crawford that allowed Ronan O'Rahilly the use of Project Atlanta's London studio to record programmes for Radio Caroline in return for use of the Greenore port facilities. 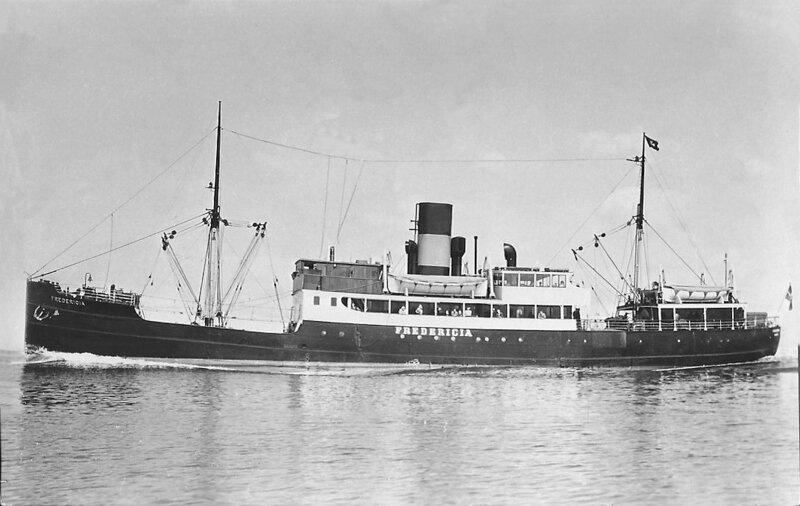 During February and March 1964 both vessels underwent extensive conversions at Greenore but Crawford's ship was required to leave its berth and anchor in the harbour for a week, to make way for other freighters when her new aerial mast failed to arrive, which increased her refit time considerably. The 'Caroline' mast was 135ft and 13 tons, made of steel, whereas the 'Mi Amigo' mast was to be 141ft and only 3 tons as it was made of aluminium. There are also many quite believable stories about various 'acts of sabotage' which slowed progress on Atlanta's ship and, ultimately, delayed her departure. An example of this is the fact that two sets of the 'crystals' necessary for broadcasting had been ordered from the U.S.A. but 'Caroline' kept both sets, resulting in 'Mi Amigo' having to use temporary crystals which were of a slightly different frequency which caused some initial interference to and from other transmissions. 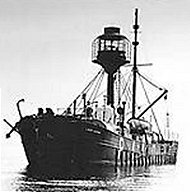 Crawford and O'Rahilly had agreed to avoid mutual competition whereby 'Mi Amigo' would broadcast to the south-east of England and 'Caroline' would anchor off the Isle of Man to cover the north-west and Crawford was stunned when 'Caroline' left Greenore on March 26th, sailed around the south and east of England and dropped anchor three miles off the coast of Felixstowe on Good Friday March 27th. Radio Caroline put out her first test signals on the same day, at 9pm. Just before noon on the following day, Saturday 28th March, journalists looked on at 'Ye Olde Cheshire Cheese' pub on London's Fleet Street as Ronan O'Rahilly attempted to tune in his radio to the Caroline signal. Failing to get any kind of reception indoors, he took them out into the street where they heard a broadcast that was playing Ray Charles songs repeatedly. This was done so that O'Rahilly could be sure he had the correct station tuned in! Radio Caroline had announced a wavelength of 199 metres but was actually broadcasting on 197.3 metres. At the time, U.K. stations advertised their wavelength in metres and radio tuning was done with an analogue dial, therefore there was some leeway between the actual transmission wavelength and that which the station stated. Midday came with DJ Simon Dee announcing "This is Radio Caroline on 199, your all-day music station". This was followed by a pre-recorded programme, hosted by Chris Moore, and the first record heard was 'Not Fade Away' by The Rolling Stones. Some of the first advertisements carried by the new station were for News of the World, William Hill Turf Accountants, Bulgarian Holidays, Ecko Radios, Peter Evans Eating Houses, Harp Lager and Kraft Dairylea Cheese. Only three weeks after it started the pirate station had an estimated 7 million listeners! Although only transmitting at 10kW, Radio Caroline was only about 80 miles from London, which meant that her signal was stronger than Radio Luxembourg in the capital. A frustrated, annoyed and disappointed Allan Crawford and 'Mi Amigo' did not leave Greenore until mid-April, the ship's troubles continuing as she sustained damage off Land's End when her radio mast broke on April 21st, forcing her to put into Falmouth for repairs. She eventually reached her intended anchorage on April 27th, 3.5 miles south-east of Frinton-on-Sea and within sight of 'Caroline'. Their one advantage was that they had studied the charts better and anchored in the Wallet Channel, between Frinton-on-Sea and Gunfleet Sands, which potentially provided better shelter from rough seas and currents. Even so, a further 3-day delay occurred when rough weather made it impossible for the technical staff necessary for operating the transmitters to get aboard. Radio Atlanta began test transmissions on May 9th, rather cheekily using the same wavelength, and therefore audience, of Radio Caroline when she went off the air for the evening. The initial test transmissions were made with announcements in French to avoid identifying themselves. Bob Scott, one of their six disc jockeys, was heard saying between records "You are tuned to Radio Atlanta. This is not a regular format, it is a test format. I repeat, this is a test format", the frequent insistence that these were only test transmissions having the major benefit of advertising the new station to a ready-made audience. Regular programmes began on May 12th using 200.6 metres, 1493kHz, very similar to Radio Caroline, and were broadcast from 6am to 6pm which was very soon extended to 8pm. For the first few weeks their entire broadcasting staff consisted of a Texan father and son, Johnnie Jackson and Bob Scott, who relished using phrases like 'the most on the coast', 'the music queen of the seven seas' and 'the ship that rocks the ocean'. They never referred to the 'Mi Amigo' by name, but always as 'The good ship Radio Atlanta'. A large proportion of Radio Atlanta programmes were pre-recorded and sent out to the ship for transmission on the same or following day, except when weather conditions made this impossible and the DJs had to present live shows. Musical output was a bit of a mixture, largely featuring cover versions of current hits by little-known artists, because they were on the Rocket, Cannon and Sabre labels, all of which were owned by Allan Crawford. Although viewed as a 'pirate' station, Radio Atlanta's operations actually stayed within the current laws and they operated out of offices in Soho, fronted by Project Atlanta Ltd. Initially, Atlanta and Caroline operated independently, although they were occasionally serviced from Harwich by the same tender boat, leading to many anecdotes of records, jingles and supplies being 'acquired' by the opposing station.